Tron is an interesting project. As a smart contracting platform, its objective is crystal: Build one of the largest blockchain-based operating systems in the world. Their unwavering dedication to deliver on this mandate can’t be doubted. So far, their track records have all the characteristics of ambition as they build the framework contributing to infrastructure of truly decentralized internet. Clues are everywhere. Months after launching their mainnet and following it up with a Tron Virtual Machine that is not only compatible with Ethereum’s VM, the co-founder is apparently reaping the benefits of his tireless marketing efforts. Nevertheless, like the rest of the market, TRX is down but not out like Bitcoin Cash. As a matter of fact, its resilience has earned it a temporary spot in the top ten. With projects migrating from Ethereum to Tron, sooner or later, TRX will soon steady and cement its spot above Cardano. In a tweet that might have changed the views of BitGuild, Sun replayed the benefits of what migrating projects are set to reap from the platform. Bitizens, and the world of Bitropolis is moving to a new home on the TRON network. Other than the high throughput—2,000 TPS and increasing network activity—processing 1.96 million in the last day, the network plans to integrate zk-SNARKs by Q1 2019. With a market cap of $884 million, TRX is the 11th most valuable coin in the space and could flip ADA, earning a spot in the top 10. But before that happen, losses are still steep and TRX is actually the top performer after shedding 8.1 percent in the last week. 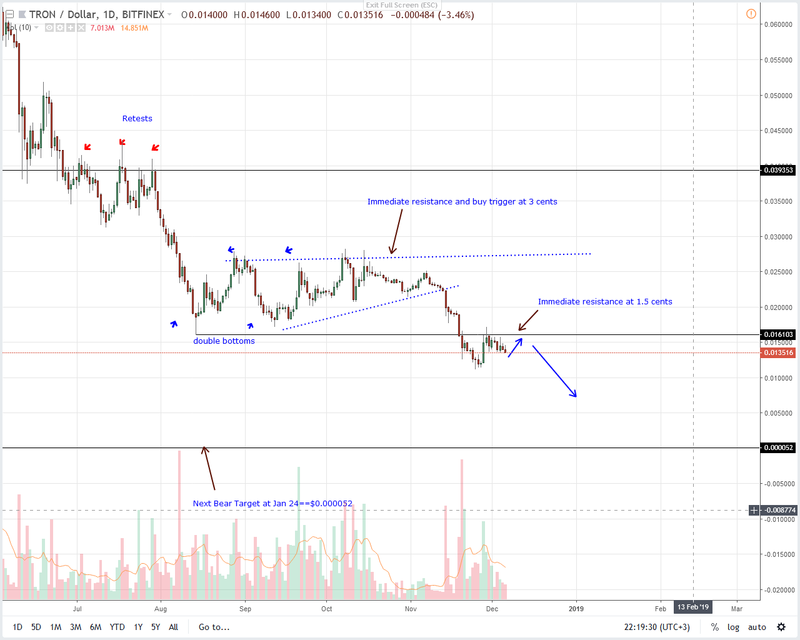 Still, TRX bulls have failed to thrust prices above the main resistance—former support level—at 1.5 cents. From simple candlestick alignment, bears are in control. As they trade within a bear breakout pattern set in motion by week ending Nov 25 losses, we recommend traders to search for selling opportunities in lower time frames more so if prices fail to break and trade above last week’s highs of 1.7 cents. Losses in the last day are mild and this is perhaps positive development as far as TRX/USD price action is concerned. From an effort versus result point of view, bulls are in control albeit temporarily thanks to the failure of sellers to wipe out gains registered on Nov 28. Even with this, we shall take a cautious approach aware that it will be price and morale boosting for traders is there is a follow through of those gains as bulls flock in propelling TRX prices above 1.5 cents main resistance line helping nullify the bear breakout pattern of week ending Nov 25 and triggering short term bulls aiming at 2 cents as a double bar bull reversal pattern prints in the weekly chart. That is the ideal forecast but if there are declines today and for some reason TRX/USD prices drop below 1 cents then it is likely that Tron will test its all time lows in Q1 2019.